When I began building effects, I built directly on perfboard and sometimes, I had never before heard the circuit. This led to, on a few occasions, being disappointed with the sound and later de-soldering the valuable parts and throwing away the rest. Other times, I would want to modify various components and would need the soldering iron for that as well. I soon purchased a small breadboard to facilitate proper prototyping and experimentation. 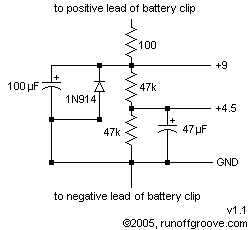 I was able to explore all possibilities of a circuit and make a more educated decision on whether I should commit the project to perfboard. However, since my breadboard is small (but usually accommodates the complexity of circuits I'm interested in) I find it a bit "crowdy" with high-parts count projects. I realized that for nearly all projects involving an IC, I would need to build the same voltage divider that required a small portion of the breadboard. I decided to build an off-board voltage divider with three leads: +9 volts, 4.5 volts, and ground (earth). I also included power supply filtering and reverse polarity protection. This little unit removes 6 components from the breadboard and replaces them with three wires that are much easier to place within a complicated circuit. 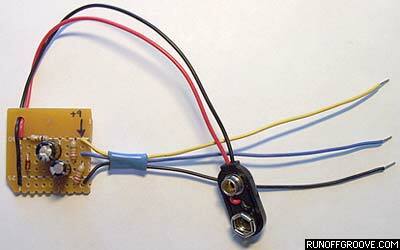 The only parts recommendation is to use either solid-core or pre-tinned wire for the leads. Pushing hand-twisted stranded wire into breadboard holes is only easy the first time, if ever. Build a breadboard power module by runoffgroove.com is licensed under a Creative Commons Attribution-NonCommercial-ShareAlike 3.0 Unported License.